The weight of the Ages presses upon humanity. It is this weight, the weight of apathy, the weight of ignorance, the weight of selfishness which shuts the doorway to the Light. The doorway to the inner worlds of Light can be found be all people. It is not a doorway for the select few; it is not a doorway for only those initiated into certain sects, certain beliefs or only for those special elite who happen to belong to a particular privileged group. The doorway to the inner worlds if for all those people who earnestly seek to make the world a better place. It is a doorway accessible to those who sincerely wish to change themselves and the planet. It is a doorway which can be found and entered into through diligence and a sincere will-to-good. What does this phrase will-to-good mean? In short will-to-good entails a willingness on the part of the personal self to accept certain routines, disciples, and guidelines associated with spiritual living. It is no good pretending that one is an earnest seeker of the Path of Light if in fact you wish to keep your old ways of destructive living, destructive thought, destructive emotions. To become an earnest seeker of the Path is to invite the Light of Transformation into your lives. This light, if you will allow it, has the capacity to completely transform your life. 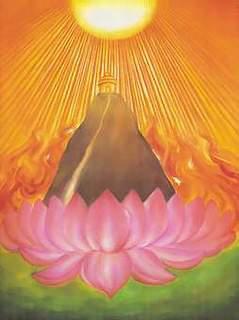 The Light of Transformation is none other that the Violet Light which emanates from the Heart of the Bodhisattva Maitreya via Lady Portia and Lord Count of St Germain. It is through these holy ascended Beings that the Violet Light of Transformation reaches the earth. It is carried on wings of violet angels, who assist all those who earnestly seek to redeem themselves of their ancient, and more recent, negative actions. We all have a shadow and it is this shadow which seeks to inhibit us at every step of the way. If we abide by the wishes of our shadow we find ourselves in a world of darkness. Instead, learn to invoke the light of your soul and Spirit and when it comes to you be willing to let go of the past which holds you back. It is a strange phenomena how we are attached to our past. For example, one person may have a habit of suffering that comes from lifetimes of suffering. Despite their earnest wish to be free of their suffering an aspect of themselves, their shadow self, is comfortable and familiar with this suffering. Therefore they find themselves pulled in two directions. On the one hand they respond to the call for change and yet it brings forth, from deep within their shadow self, an aspect which is afraid of change, which actively seeks to sabotage that change in their life. This dilemma is not uncommon on the path of Light, in fact it is extremely common. What is uncommon is the realisation on the part of the earnest seeker, that we are our own saviours and our own oppressors. Do you sometimes feel oppressed by aspects of yourself – your negative thoughts, your fears, inhibitions, guilt, etc. Learn through the art of meditation to recognise such saboteur aspects of your personal self. Empowerment of the higher Self is the goal of all true meditation. It is much much more than an art of relaxation. It is the Path to Liberation. It points the way and if we can allow the Light to enter into our darkened minds, our darkened hearts and our darkened bodies then grace enters like a stream of Living Light. We all have the power of choice. Choose to lift yourself into the light of your soul and Spirit, through meditation. It represents a Path of Grace, a Homecoming an entry point to peace, to Light, to forgiveness and Oneness.